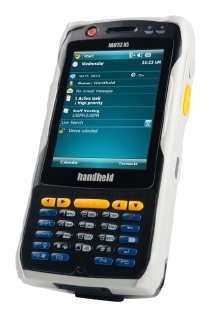 Sweden’s The Handheld Group has released its new Nautiz eTicket Pro rugged PDA with an integrated Mifare-compliant smart card reader for transport ticketing applications. Developed and designed by Arcontia, the ISO 14443 A/B, ISO 18092-compliant reader also supports NFC mobile applications, such as smart posters and tickets, and features both passive reader mode and active peer to peer mode. The Nautiz eTicket Pro comes with an 806 MHz processor, 56 MB RAM and 512 MB built-in Flash storage, integrated 2D imager, WLAN, Bluetooth, 3G cellular capabilities and GPS. Operating on Windows Mobile 6.1, the device also boasts 3 integrated Secure Access Model (SAM) slots, which can work in parallel or independently of each other, as well as an integrated 3 mega-pixel camera with autofocus.